Nets: Spencer Dinwiddie and Jarrett Allen each scored 12. Dinwiddie had six assists. Allen had eight rebounds. … Brooklyn was 11 of 36 on 3s, moving within 16 of breaking the single-season franchise record (1,041), which they set last season. … The Nets had a 52-33 rebounding advantage including a 17-5 edge in offensive rebounds. … DeMarre Carroll left midway through the third quarter and headed to the locker room with an undisclosed injury. He did not return to the game. Pacers: Sabonis recorded his 30th double-double of the season. … Bojan Bogdanovic had 13 points, while Cory Joseph added 12. 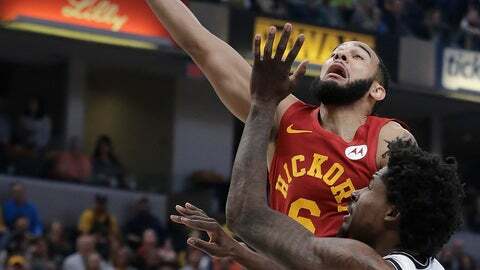 … Turner finished with six points, four rebounds and three blocks before leaving with a sore right ankle midway through the third quarter. He did not return but said he would be fine for the playoffs. … Darren Collison was 2 of 12 from the field and missed all four of his 3-pointers after missing the previous three games with an injured groin. He had four points and six assists.